GOLD AND BLACK ILLUSTRATED VOLUME 28, ISSUE 6 6 Wins by the baseball team this season, the second-most in program history. The Boilermakers, who finished second in the Big Ten, advanced to the NCAA Tournament for only the third time, then beat North Carolina A&T for only the program's second NCAA tourney win. Needing Best Efforts J oe Tiller frequently used the term "manage expecta- tions" when discussing the upcoming season on the heels of an exciting one. Those words are good for the fanbase to have in the back of our mind. You will read throughout this magazine that the 2018 version has challenges ahead. The Boilermakers will need to be at their best to win their share of games this season. Whatever that share is. And "manage expectations" doesn't mean the team involved shouldn't work to far exceed them. The thing I like most about Coach Jeff Brohm and his staff is their collective refusal to stand still at any point. Brohm does a good job of being honest about the challenges ahead, but never seems willing to let his team or his staff off the hook for any sub-par efforts. I think anyone in their right mind would have predicted four wins for Purdue in 2017, and privately maybe Brohm thought that was reasonable as well. But he never let on to that notion of settling. This is why he and his program will continue to be successful at Purdue. 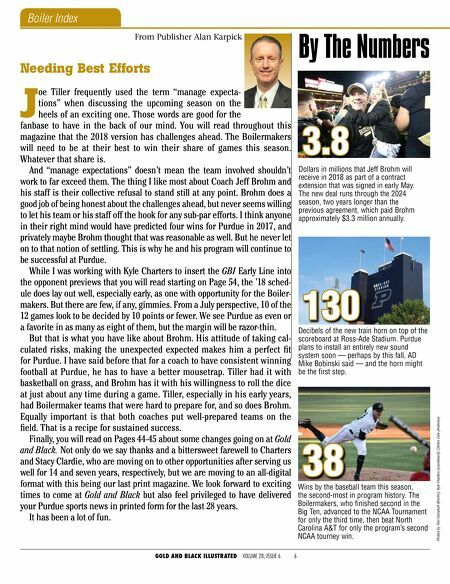 While I was working with Kyle Charters to insert the GBI Early Line into the opponent previews that you will read starting on Page 54, the '18 sched- ule does lay out well, especially early, as one with opportunity for the Boiler- makers. But there are few, if any, gimmies. From a July perspective, 10 of the 12 games look to be decided by 10 points or fewer. We see Purdue as even or a favorite in as many as eight of them, but the margin will be razor-thin. But that is what you have like about Brohm. His attitude of taking cal- culated risks, making the unexpected expected makes him a perfect fit for Purdue. I have said before that for a coach to have consistent winning football at Purdue, he has to have a better mousetrap. Tiller had it with basketball on grass, and Brohm has it with his willingness to roll the dice at just about any time during a game. Tiller, especially in his early years, had Boilermaker teams that were hard to prepare for, and so does Brohm. Equally important is that both coaches put well-prepared teams on the field. That is a recipe for sustained success. Finally, you will read on Pages 44-45 about some changes going on at Gold and Black. Not only do we say thanks and a bittersweet farewell to Charters and Stacy Clardie, who are moving on to other opportunities after serving us well for 14 and seven years, respectively, but we are moving to an all-digital format with this being our last print magazine. 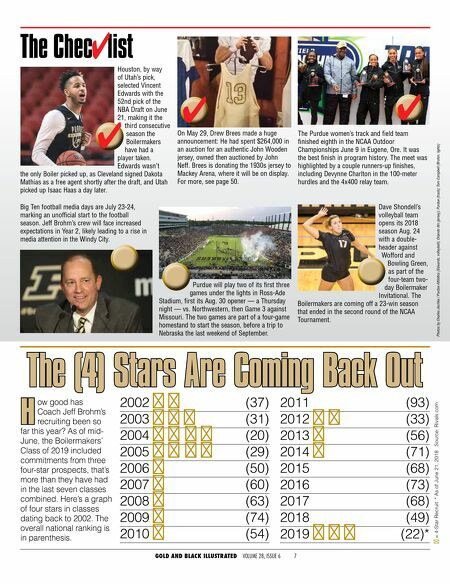 We look forward to exciting times to come at Gold and Black but also feel privileged to have delivered your Purdue sports news in printed form for the last 28 years. It has been a lot of fun. Boiler Index From Publisher Alan Karpick By The Numbers 38 130 3.8 Photos by Tom Campbell (Brohm); Kyle Charters (scoreboard); Clinton Cole (Andrews) Dollars in millions that Jeff Brohm will receive in 2018 as part of a contract extension that was signed in early May. The new deal runs through the 2024 season, two years longer than the previous agreement, which paid Brohm approximately $3.3 million annually. Decibels of the new train horn on top of the scoreboard at Ross-Ade Stadium. Purdue plans to install an entirely new sound system soon — perhaps by this fall, AD Mike Bobinski said — and the horn might be the first step.